Get Zap! news via e-mail. Hit Web Counter classic gamers, and was last updated on Sunday, February 7, 2016. 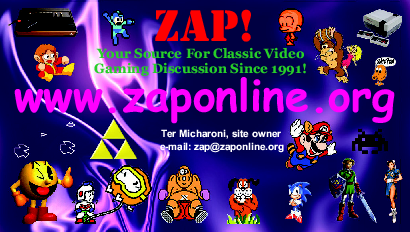 Your source for classic video gaming since 1991! Welcome to Zap!, video game fan! Back in the early 90's, Zap! was a bi-monthly video game newsletter I used to publish. The first issue was September, 1991. It covered mostly classic systems and computers, with some newer stuff as well. It was even reviewed in Electronic Games magazine, but that's old news by now. It was a pain to publish, and it bit the dust by early 1993. Now with technology moving on, why not make Zap! a WWW site? Well, here it is. Zap! will cover all sorts of systems and games, old and (sometimes) new, but since 80's systems are my favorites, (like games from the great era of 1987-1989), most of this page will be devoted to games from those years. I plan on reviewing lots of games, adding more links, and a top 10 best games ever list for other systems (to go along with the top 10 NES and SMS list) as well. The exiting news I have this month is that the Zap! Instagram and Tumblr finally went up! Check it out! Also, be sure to check out our Facebook, MySpace, Twitter, and YouTube accounts. We have been doing exceptionally well on social media and will continue to grow in the future. The Zap! business cards also came out nice, have a look. The forums are also more than seven years old now (January 19, 2009), so please check them out and post! Chat about classic, current, and future video games with gamers around the world in the forums. Join my Facebook Group, which is a great place for discussion of classic gaming. Please "Like" our Page, we are now at over 4.500 "Likes" and growing! We finally made it to Instagram as zaponline. Follow us and "Like" our posts! Join our MySpace page! Right now we have over 700 friends. Follow us on Twitter and help us continue to grow. The Zap! YouTube Channel only has a few videos so far, but that will change soon. Please subscribe! Let's video game daydream a little..
Video game news and odds and ends I like to call tidbits. Enter the video game land of the unknown. Strange gaming-related little bits and pieces that can't be explained or are too weird to try! This is an exceptionally rare newsletter from Sega. Much like Nintendo Fun Club was to Nintendo Power, this was the precursor to Sega Visions. There were only seven issues made, and here they are, scanned to .pdf for your enjoyment! This is brand new domain name that I just registered, dedicated to Men-A-Vision, the company that designed the ultra-rare Atari 2600 game Air Raid. Check it out! Zap! was a newsletter that I founded, with an original run from 1991 to 1993. It was first created with an Atari 1040STe computer, and printed on a dot-matrix printer. Click on the link to learn more about it or to buy a complete, re-mastered set of all eight issues for only $10! 1991-2016 Ter Games, inc. All rights reserved.